I enjoy fishing for anything, from minnows to mullet and sticklebacks to shad but I prefer sea angling because of the freedom to do what I like. 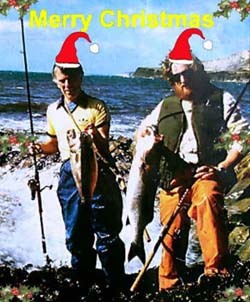 When I first came to Dorset my pals and I used to fish in the sea throughout the year. We soon found that in the winter months the catches were often few and far between although we did land some very big conger and pollack from the shore. Even from charter boats the inshore fishing was, at best, patchy. To cut a long story short we soon evolved a pattern of fishing that enabled us to keep on the move (thus avoiding freezing our nuts off) and gave us a chance of catching decent fish in every month of the year. If this plan involved no sea fishing at times - so be it! April to November is basically shore fishing for bass, mullet and wrasse: October to March finds me in search of pike, perch, chub, dace and grayling in the local rivers. Until the mid 1990's I also used to spend the spring and early summer fishing for salmon in my local river Frome but increasing restriction of methods and declining stocks of fish have put me off. If I get the chance I still like to try and develop methods or to catch something new or different so the basic seasonal pattern tends to be interspersed with a variety of other types of fishing. The "Catch Fish" spot will reflect this annual cycle of fishing. As I said, although most of my fishing year is spent on the sea shore I still enjoy other forms of angling. 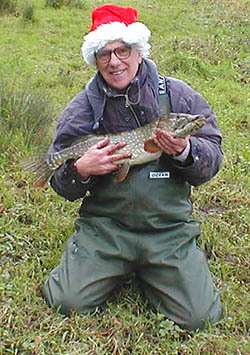 Once winter comes and the bass, mullet and wrasse have thinned out the local rivers tend to get more of my attention. Even through the summer if the tides are wrong or the weather is bad I often switch my attentions to coarse fishing. To keep this page going over the next couple of months I shall be describing a few freshwater sessions. Of course I shall put in any sea trips that I make but hopefully a few people may be encouraged to try something different next year. Certainly the freshwater fish are just as attractive and interesting and they present plenty of challenges to keep me occupied. In fact, last summer I did quite a bit of carp and tench fishing on some local lakes. It's years since I fished for either species so my approach is probably very old fashioned. Most of the sessions were short (a couple of hours) and since I had never fished the particular waters before I concentrated on surface baits as a means of finding out what was in them. On arrival I threw a few handfuls of Chum Mixer into a half a dozen likely places and once I saw or heard fish taking my free offerings I lowered a free lined bait into the centre of activity and waited for a bite. If nothing was forthcoming, in five or ten minutes, I moved along and tried another spot. Anyway, more of that at some other time - the thing that struck me was the amount of gear that other coarse anglers on the water were taking with them. Most people fishing the lakes were using two rods, set up on buzzers and baited, ostensibly, with boilies of some kind. To get their gear to the water they almost invariably had some sort of trolley or barrow. Of course there's nothing wrong with that but heavy kit is not compatible with moving about. In general once everything is set up you are there for the long haul. It struck me that many anglers must have become accustomed to finding a swim and staying there. Methods which require a mobile approach, such as floater fishing, stalking or spinning are probably non-starters with most people. 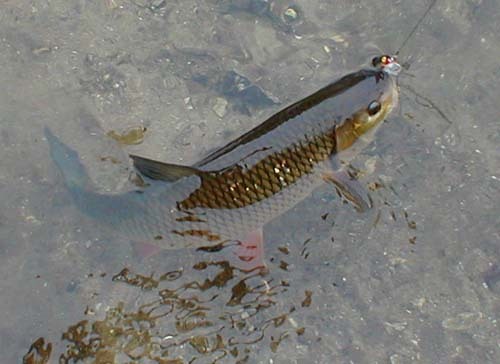 Of course, fishing for coarse fish with artificial lures is still very much a poor relation compared to traditional use of float or leger tackle. Lots of pike are caught on spoons, spinners and plugs but the number of other species falling to artificials is pretty small. Despite this lack of interest, fishing for species such as chub with artificials can be very exciting and rewarding. It is pretty rare for me to blank in a short session on my local rivers. Often I see the fish take and a fair proportion of those caught are a good size. The rivers I am fishing are often shallow and clear with gravelly, weedy beds, so I started off by using plugs which float on the surface and dive down to a foot or so on the retrieve. I already had a good selection of jointed Rapalas ,because I use them in the sea, so these were my first choice. I thought at first that little plugs of 5-7 centimetres would be the best bet but not so! It turned out that even small chub of half a pound or less are quite happy to chase and seize an 11 centimetre lure. There are essentially three ways to fish. The easiest is to flick the lure out and let it drift down with the current to a suitable hole or channel and then wind it slowly back against the flow. 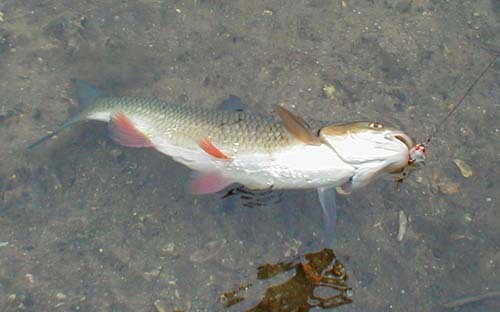 The second is to cast upstream into likely places and retrieve fast enough to make the lure work with the current. Lastly, if you are confident with your casting, pitch the plug across the river into bays, under bushes and alongside reed beds, retrieving down and across. All three methods can be effective. Of course chub are not the only things you will catch. Perch and trout often take plugs and if pike are present (they always are in Dorset and Hampshire rivers) a wire trace will be needed. I tend to fish with six pound BS braid and a fifteen pound wire trace all the time.